£150 million is available annually for projects that keep the UK aerospace sector at the pinnacle of global performance. 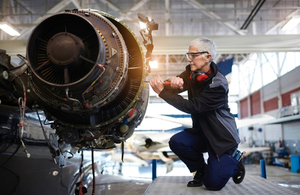 The investment is part of the £3.9 billion UK Aerospace Research and Technology (UKART) programme, a partnership between government and industry, managed by Innovate UK, the Aerospace Technology Institute (ATI) and the Department for Business, Energy and Industrial Strategy. 20 March 2019 Corrected competition deadline and other dates and grant funding details.